Northern Lights of rare intensity were observed in several regions of Russia's north at the start of the year. Clear frosty air with cloudless skies and no snow storms let both locals and tourists capture the stunning natural light show. The natural phenomenon was observed in northern Russia's polar regions, in Karelia, Murmansk and Arkhangelsk and were even reportedly seen near St. Petersburg. Although the aurora borealis is not a rare occurrence in this part of the world, the recent glow was particularly spectacular, as the skies were clear of clouds and it didn't snow. A photographer from the Murmansk region, Valentin Zhiganov, spent several hours in the freezing cold, braving -20 degrees C (-4 F) temperature to film the glowing skies. Astronomers say the natural phenomenon has become more frequent over the past decade, reaching its highest level for 14 years in 2014. 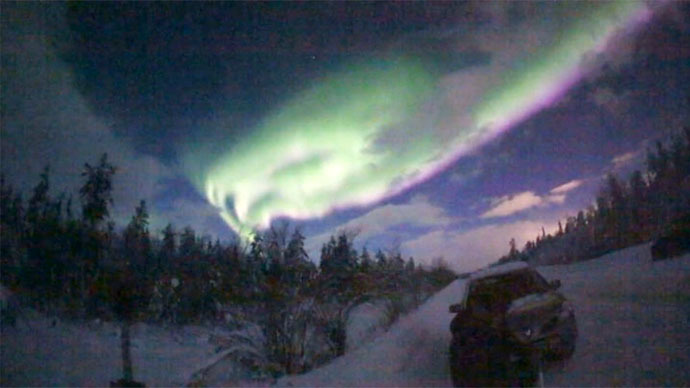 In December, people in the northern areas of the Murmansk region observed the lights sometimes up to five times a week. Experts say the phenomenon poses no danger to people. Caused by charged particles colliding with atoms high in the Earth's atmosphere, it is believed the intensity of auroras can be caused by high-speed winds containing solar particles. But unlike geomagnetic storms of the same nature, the glowing skies have no harmful effect. "[In 2014] auroras have appeared more often than over previous years, as a natural result of maximum solar activity, with the maximum frequency of solar bursts having been reached," Stanislav Korotky, head of scientific projects at an observatory in the Moscow region told Interfax. Such activity peaks happen every 10-12 years, scientists say. While Northern Lights are a popular tourist attraction in Finland, people in Russia's Murmansk region hope the glowing skies will lure more people to their beautiful land. Although it's dark during most part of the winter, auroras can certainly lighten up the mood of both locals and visitors.